Mangalore, Sep 01, 2014: Opportunities to economic progress should be accessible to villages too, said Sri Kshetra Dharmasthala Dharmadhikari D Veerendra Heggade. He was speaking after inaugurating the office of ‘Vishwa Tuluvere Parba’ at Mangalore Taluk Mahila Mandala Okkoota building in Urva Store on Sunday. Heggade said that economic development today is city-oriented. Instead, focus should be upon the overall development of the district, including rural areas. There is a need to develop roads, basic amenities, health centres, veterinary hospitals and school facilities in villages and ‘Vishwa Tuluvere Parba’ should be a path finder to these issues, Heggade said. He further said that the people of Tulunadu have marked the name of the region in the world map through their achievement in various fields. Educational institutions of the region are catering to the needs of people belonging to outer states as well. Tulunadu has its own stamp in trade, commerce and industries. The people of Tulunadu have a responsibility to uphold the culture of the region. While we recall the history, we should not forget the present and future. 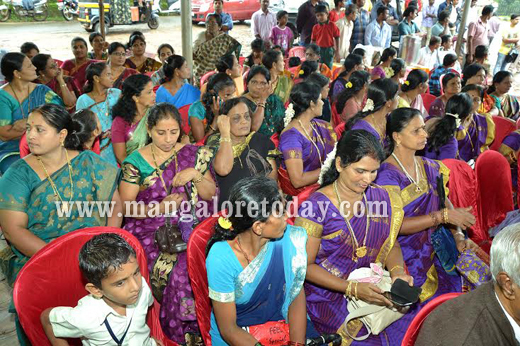 The significance of Tulu language lies in its binding power and it is an icon for solidarity, he said. Heggade meanwhile hoped that Vishwa Tuluvere Parba will attract Tulu speaking people from across the world and their contributions will be instrumental in the development of Tulunadu. Heggade, who is also the Honourary President of the Vishwa Tuluvere Parba said that Vishwa Tuluvere Parbha will be held on the premises of Sahyadri Engineering College in Adyar on December 12, 13 and 14. Cultural and literary programmes along with exhibition, competitions and entertainment akin to Tulunadu culture will be organised. ‘Atil Aragane,’ an expo on Tulunadu cuisine will be among the prominent features of the convention, he said. Heggade invited all the people to the Parba and said that the cooperation of Tulu organisations, various government departments, university and educational institutions for the success of Vishwa Tulu Sammelana is complimentary to the success of the same. MLC Ivan D’souza speaking on the occasion said that efforts will be made in the next Legislative Council session to take up the discussion regarding the conferment of constitutional privilege to Tulu. Also, a request will be made to the Chief Minister to take a council of ministers from Dakshina Kannada and Udupi districts to Delhi to press upon the enlistment of Tulu in the eighth schedule of the Constitution, he added. DK district in-charge Minister B Ramanath Rai said that the family life of Tulunadu is an outstanding model in the social system. Entrepreneurship is at its best in Tulunadu. Many success stories of people in the fields have its origin in Tulunadu. Rai further said that language is a tool for social harmony and the pride on the language is beyond the barriers of caste and creed. He opined that the forthcoming Vishwa Tuluvere Parba will play a vital role in establishing communal harmony in the society. Karnataka Tulu Sahitya Academy President Janaki M Brahmavar also spoke. MP Nalin Kumar Kateel, Akhila Bharatha Tulu okkoota President Dharmapala Devadiga, Vishwa Tuluvere Parba General Secretary Nitte Shashidhar Shetty and others were present. A plea to Tuluvas, towards the Vishwa Tuluvere Parbha, was released by Minister for Health and Family Welfare U T Khader. B Ramanath Rai meanwhile unveiled the Vishwa Tuluvere Parbha logo, designed by artist John Chandran. A Memorandum was submitted to government through Ramanath Rai to include separate code number to Tulu language in the column number 11 of the state social and educational survey. The minister assured of making positive efforts towards the same. The website www.vishwatuluparbha.in was also inaugurated. The website is designed by the team of students from Srinivas Engineering College, Mukka.